Only recently I realised the videos posted here are not displayed correctly with Microsoft's broswers (Edge and Internet Explorer). Video boxes don't show the videos on Microsoft Edge / Internet Explorer. 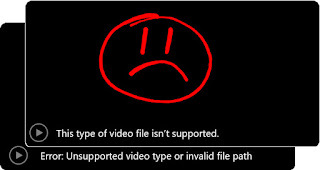 Some people say this problem started after the (Windows 10) "Creators" update, others that Microsoft never gave support to the video format (WebM). So, if you are having this problem, please,access this site using a decent browser: Mozilla Firefox or Google Chrome.